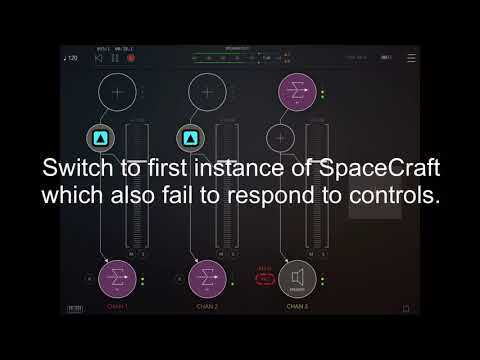 @deltaVaudio In the latest update of Spacecraft, a second AU instance of SpaceCraft doesn’t load or work correctly. The sample won’t load nor will the second instance play correctly. Will try more AU hosts and report back. Had the same problems and not seeing the state saving of audio files working ? I don’t see the AU state savings working either though it was my understanding it wouldn’t be in this update. State savings is not in the update I believe but the Dev will work on it in the future, may I ask what host you are having issues with please? I’ve tried it in GarageBand, Cubasis, and Moebius Lab on an iPad Air 2 running iOS 11.4. Will try more AU hosts too. It doesnt show here in ANY app, not as au, not as Iaa. 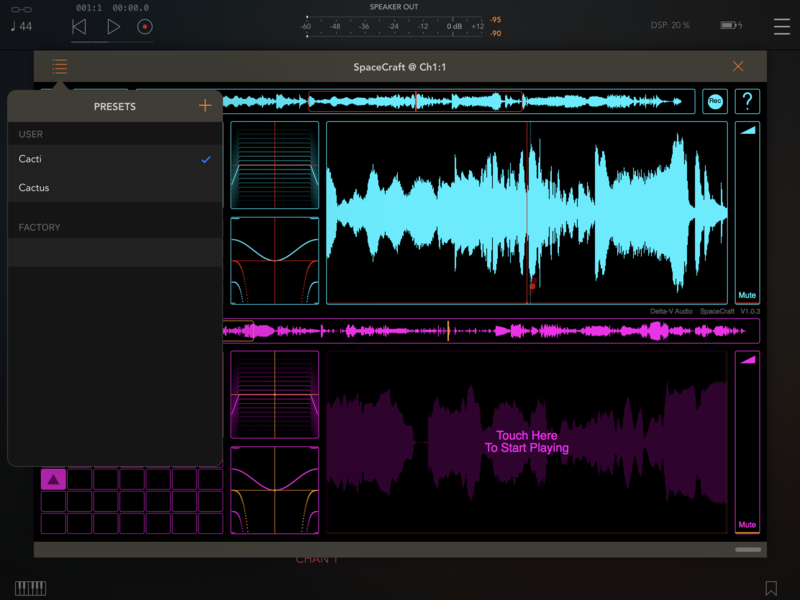 SpaceCraft AU on on an iPhone 6 running iOS 11.4 in Audiobus 3 and AUM has issues with the second instance of SpaceCraft loading a sample and running correctly. I’ll make a video of what happens. Did you look for SpaceCraft as an effect app, it doesn’t show up otherwise? This is so you can record directly into SpaceCraft. Using SpaceCraft in AUM on an iPad Mini 2 running iOS 11.4. The first instance has two user samples and the second has default samples. When I tried to load user samples into the second instance of SpaceCraft, its controls stopped responding. Multiple AU instance bug: When using multiple instances of AU, file loading is always performed in the first AU instance opened. This is a bug which will be fixed in the next update! Make sure the first AU instance is visible when loading files in another AU instance or Spacecraft will become unresponsive. ... so you just need to have both instances visible when you are loading files. This has already been fixed so I can provide this in a quick turnaround update. Should be available by end of the week. @yonhorizon This is the first time it has been mentioned that spacecraft has not appeared as AU effect OR IAA effect! Which host are you using? Yeah sorry, didnt know its an effect. All good. @dawdles anything that happens inside the file chooser is an iOS behaviour and out of my control. I will keep eye out for that tho. I am able to save presets here, but they do not recall the sample or parameter settings when I open them, maybe I am doing it wrong ? @reasOne presets and state-saving are not supported, if you can save them then my job might be easier in getting them to be recalled, so that's interesting. I'll be looking into that very soon but I'll take the opportunity to do a quick fix for this multiple AU file loading thing. You might want to mention about going to your website on the App Store description of the app to get more details on the quirks of the app. I actually did check out your website but didn’t think I’d find details about the update in the about section. I’m sure it’s difficult to strike a balance between releasing an update with some new features that work which people have been asking you for versus releasing an app which you know still has some bugs in it. I think it might be good to consider having the app available as a generator and then document via a message that you won’t be able to record samples unless it’s in the effect slot should people try to do so. Many people are so used to doing things in particular ways that they frequently don’t bother to read instructions because they assume an app will work in a particular way. In addition, almost always when apps are in the effect slot you can pass audio through them whereas this isn’t possible with SpaceCraft (i.e. input audio only active when recording a sample in). Listing this in the documentation might be helpful. With iDensity, you can load in files like in SpaceCraft or use a live feed as a source which would be a nice feature to have in SpaceCraft. Being able to load files in AU directly from the iCloud drive is really great and something I’d never seen before and hope other apps do so too. Hi @InfoCheck thanks for the feedback, some good ideas there. "Partial support of AUv3 as AU Effect (see https://deltavaudio.com/about/) "
I think for the next release I'll put that link at the top to make it more noticeable! I was aware of the multi-AU file loading issue but I thought people would be happy with in the mean-time being able to load files in a single AU at-least, whilst I figure out the multi-AU thing. Since then it turns out that the multi-AU issue has already been solved by somebody else (like, yesterday) so fortunately I can do a quick follow up release for what I thought would be a much harder problem to solve! The App Store has significant room for improvement and it’s too bad they don’t provide active links. At least now developers have the option to respond to reviews so you can mitigate confusion. I appreciate the time you’ve taken to let us know what’s going on with your app and adding great new features to it. When I tried the about link I got the following message in Safari so you might want to take out the https to eliminate it (I think?). Ah nice one, I'll do that ! So is the only way to save what your working on to record it out to wav? Yes, on the developer’s website he talks about adding state savings and presets as priorities in “a forth coming update”. I've put this on the website: when the file chooser (white background) is open make sure you don't close the AU window. Either choose a file or tap cancel. This rule applies to single AU instance too. I am not able to import and samples from AudioShare (or anywhere actually). When I press "Import Sound" I get a window that says "Load Audio from your device: iCloud, DropBox, Google Drive etc". (no mention of AudioShare, even if it is open in the background). When I press the speaker icon I get an iCloud Drive option but nothing else. I have delted the app and reinstalled with no success. Do I need to switch iCloud on (or off)? Do I need to upgrade to iOS 11? Or is it something else? @simon I'm afraid it's because you're on iOS10. It's not a bug, I mention this in the app store description. And also on the about page of my website. If you are able to upgrade to iOS 11 then you can configure the iOS files app to include audioshare as a location, then spacecraft will see it. Mark you rock! Thanks for all your work and the presence here, the listening and the dedication to your app!! !